It isn't often that a makeup ad succeeds in being literally transformative and not just superficially so. But that's the reason for the viral success of this Japanese ad for cosmetics brand Shiseido, which launched less than 10 days ago and has already enjoyed millions of views. The spot, titled "High School Girl?" and created by Watts of Tokyo, opens with a professor opening the door to her classroom. As a soft female vocalist begins to sing over a loungy beat, we pan slowly across the faces of the girls in the room, who seem ordinary enough: One holds a guitar, another drinks from a bottle of water. At the end of the room, a last girl gives us a knowing look and gazes back down at her book. Check out the spot, directed by Shō Yanagisawa, here (spoilers below). If you can read Japanese, this is the moment when you discover what you've missed. The music abruptly transforms into a smooth rap duo. To its beat, the camera moves back the way it came. Stop-motion effects take us backward in time, before these high school girls were merely high school girls, to reveal what's behind all those placid pretty faces. 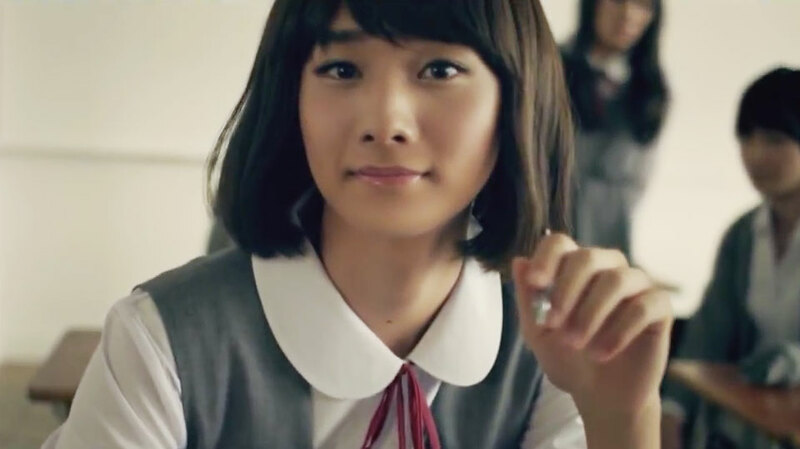 Sliding back past the professor, who's decided not to enter the room after all, the ad closes with a shot of Shiseido makeup casually splayed around a piece of binder paper, upon which is written a tagline that's almost too simple for an ad that's otherwise so interesting: "Anyone can be cute." If you watch the ad again, you can appreciate the quiet subtlety with which it shows its hand: It's less of a reveal than a call to be more attentive. The opening scene, for example, focuses not on the teacher but on what she is holding: An image of a piece of art depicting a woman. This image is flipped at the end to reflect how easily we can be fooled once we've looked at something, decided what it is, and moved on. Super ad geeks, for whom behind-the-scenes vids are never enough, will appreciate the baggage this kind of work comes packing. It benefits from being a product of its time: YouTube makeup vloggers commonly employ the tools of their trade to produce facial transformations just as impressive as what you see here, and the rise of transgender characters and celebrities in pop culture provides salient ground for it, too. It can also be compared to Dove's "Evolution" spot, which in the last nine years has probably influenced more makeup and beauty ads than we'll bother counting here. But the ad also echoes older work with deeper implications, like the 1988 play M. Butterfly, which used all the tropes of Madame Butterfly to illustrate both the fluidity of sexual identity and how a stereotypical perspective of Asians as "submissive" and "feminine" by default blinds people to more pertinent truths—including quite obvious physical ones. Beyond that, Japan is wrestling with its own postgender revolution. And while it's easy to write the country off as further behind in gender rights than we are, sexual ambiguity was built into its mythology and culture long before its exposure to the West. But we've already talked plenty; you can dive into that wormhole on your own.